Five years on from the violence that engulfed Dagestan in the late 2000s, the mountain village of Gubden is still associated with one of the most fearless units of the Caucasus Emirate, an umbrella terrorist group that aims to expel Russian power from the North Caucasus and transform the region into a sharia state. But Gubden, just south of the republic’s capital Makhachkala, has been quiet since 2011— not a single villager has joined the militant underground in the past few years. However, many of the civic activists involved in countering radicalism in the region are registered on police lists as ‘Wahhabists’. Members of Salafi mosques end up on these lists after official Islamic organisations report them to the authorities, and this extrajudicial practice of registering ‘at risk’ members of the community can have serious legal consequences. These citizens, declared unreliable by the authorities, often find themselves in a legal ‘grey area’. ‘Here’s Gurbuki, we’ll see Gubden in a moment,’ says Magomed Taimazov, a businessman, as we approach his native village. Turning the corner, Gubden appears before us—a big grey mass amidst the green hills. Life in Gubden is, of course, anything but grey, but the adjective still seems accurate—and not only because of the overcast sky. After all, this is how most people who have never been to Gubden think of this place, stuck in the shadow of its recent, murky past. In the early 1990s, the radical ideology of armed jihad took root in this village. Together with the nearby village of Gimri, home to the legendary Imam Shamil, Gubden became one of the most reliable providers of personnel for the ‘forest’, as the amorphous armed underground movements in the North Caucasus are popularly known. Gubden has always been known for its religious fervour and isolation from the outside world. Meanwhile, people in the village still observe their traditions, which include marrying only fellow villagers—an explosive mixture of religion and revolution seems to be in their blood. This cocktail was certainly in evidence as the Soviet experiment came to an end in summer 1991, as thousands of people from Gubden took to the streets of Makhachkala, Dagestan’s capital, to demand lower prices for hajj trips. Ten days after these demonstrations began, the protesters stormed the republic’s principal government buildings, and the civil unrest came to a bloody end. One demonstrator died, and the protest leader Khasbulat Gubdensky was arrested. Afterwards, the authorities opted for a policy of compromise. The Soviet government may have only permitted hajj in 1989, but, in the years since, the pilgrimage has become ever more popular, with residents of Gubden (and Dagestan as a whole) travelling to Mecca in their thousands. Several people came to profess Wahhabi beliefs following their journey to Saudi Arabia. In conservative Gubden, however, opponents to this new, imported ideology weren’t hard to find. When militants spilled over from Chechnya into Dagestan in 1999, Gubden suffered a split that is still not completely healed today, although the confrontation between followers of ‘traditional’ and ‘pure’ Islam at the beginning of the 2000s was, of course, much fiercer. For several years, Gubden lived through a ‘cold war’, but gradually the clashes became more frequent. Soon enough, it wasn’t only security personnel who were dying at the hands of the armed underground, but their ideological opponents — village schoolteachers, imams. In September 2007, the kadi, or judge, of Gudben’s mosque Nurmagomed Gadzhimagomedov was shot dead on his way to morning prayers. Gadzhimagomedov had come out against Wahhabism, and was one of the first people in Dagestan to declare a fatwa against holy war in today’s conditions. By that time, the Gubden group was already considered one of the most active and fearless armed groups of the Caucasus Emirate, and its zone of operations covered the neighbouring districts of Buinaksk, Sergokalinsk and Levashinsk—and even the capital Makhachkala. The website Kavkazpress.ru (believed to be the unofficial organ of the Dagestan security forces) indicates that the Gubden group committed more than 90 terrorist acts in Dagestan between 2007 and 2010—the number of attacks rising every year, from nine in 2007 to 31 in 2010. 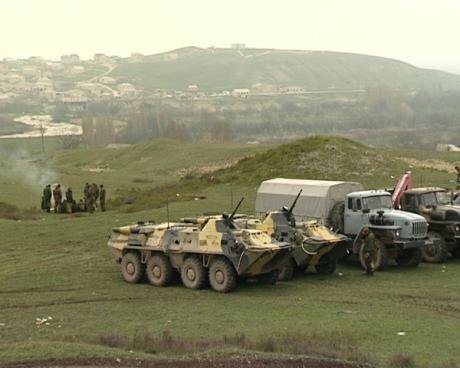 The Gubden group committed more than 90 terrorist acts in Dagestan between 2007 and 2010. Initially, the Gubden group specialised in taking out security force personnel, but in 2009-2010, they also began to attack infrastructure (a railway crossing, electricity substation and mobile tower), increasingly with the aid of improvised explosives. In March 2010, Gubden gained domestic and worldwide notoriety when two bombs went off in the Moscow Metro, killing 41 people and injuring 88. It later became clear that these attacks were organised by Magomed-Ali Vagabov, a native of Gubden who at the time commanded the Caucasus Emirate’s Dagestan front and acted as the Emirate’s supreme kadi. One of the suicide bombers involved was Mariam Sharapova, Vagabov’s wife. Later that year, in August, Russia’s National Anti-Terrorist Committee named Vagabov as number two in the North Caucasus underground after Doku Umarov, its leader. That same month, though, security forces killed Vagabov in the village of Gunib, and Ibragimkhalid Daudov took command of the Gubden group. Daudov’s reign opened with the killing of a Dagestan FSB chief, Magomedsaid Gadzhiev. In December 2010, Zaudzhat Daudova, the wife of the new Gubden group commander, accidentally blew herself up in the guesthouse of an exclusive Moscow shooting club while preparing for another attack on the Russian capital. Daudov died two years later, after receiving fatal wounds in a firefight with the security forces in the village of Gurbuki, a few miles from Gubden. As you drive into Gubden, you’re met with a sign: ‘This road opens at 0600, closes at 2100’. There’s the phone number of the watchman, too. We drive up to an archway that tells us that Gubden was founded in 1396. People from the village are already waiting for us. Magomed left a voicemail on WhatsApp about half an hour ago, and more than 30 people have been happy to respond to a request to chat with a journalist. To be honest, I wasn’t really counting on such a large reception—talking to people in a crowd rarely leads to credible information. But still, it’s impressive: after all, it’s not much of a reason to get together, but Magomed didn’t have to persuade anyone to talk to me. Soon after we start talking in the tumbledown village administration building, I realise that solidarity among residents is a necessity today. The state, if we think of it as a combination of institutions, has apparently abandoned Gubden. The only thing to remind us of the authorities’ presence here (and control over the population) is the police station and its reinforced observation posts, bristling with barbed wire. It’s become more or less calm, my new friends tell me, in the past two years. Since 2011, no one from the village has joined the militants—neither in the North Caucasus, nor in the Middle East, where supporters of armed jihad in Dagestan have begun to travel en masse. In March 2012, religious and civic leaders came to a ‘gentleman’s agreement’ with the security forces at a town gathering —they were going to start with a clean slate. The jamaat, or village community, gave their word that the militants wouldn’t receive any support in this aul. In return, the authorities had to turn down the pressure, and focus on the socio-economic development of the village. But according to the villagers, this agreement has only been observed on their side. ‘I don’t understand why they hate us so much. There has been nothing new built in Gubden since 1986,’ complains Magomedemin Nukhov, the head of the village administration. Nukhov has held this position for five years, and local residents have had to deal with their problems by themselves. According to Nukhov, there are 10,000 people registered in Gubden, although nearly 13,000 people actually live here, including many young families: 80 or 90 babies may be born in a single month. But despite a waiting list of 2,500 children, growing steadily thanks to a high birth rate, there’s still not a single kindergarten. The residents have had to buy and convert one of their own houses instead, but even then it can only take 70 children at a time. That said, the lack of kindergartens is only one of the problems here. There are frequent power cuts in Gudben, and the water supply isn’t reliable either. Roads are practically non-existent—there is only one that is asphalted. And that was done at the expense of the residents. There’s no sense in listing all of Gubden’s problems. In terms of socio-economic development, the history of this village is typical for the Russian Federation. After the fall of the Soviet Union, state farms, as a rule, turned into agricultural cooperatives. The management of these cooperatives, using all sorts of crooked schemes, gained control of their cooperative’s property and land. The cooperatives were then declared bankrupt. And thus the farmers were deprived of their claims to previously common assets. Gubden’s agricultural cooperative went bankrupt in 2012. The village used to live off livestock farming, and was famous for its produce. But the livestock has long gone, and the land has been assigned to a 49-year lease. Nowadays, the more enterprising of Gubden’s residents drive trucks full of fruit and vegetables from Azerbaijan and Iran into Russia. For those who can’t, there’s work in the quarries, where stone is quarried by hand. Those are pretty much the only sources of income around. Ignored by the state, the residents of Gubden have had to build their own kindergarten. Photo (c) Badma Biurchiev The school gym, the only place to hang out in the village, is open from morning to night. Lots of young men want to train, and this gym has produced some world and European champions in boxing, wrestling and Wushu. For these men, this is a chance to get out into the world, and those who succeed are examples for those left behind. The authorities may have been able to get way with ignoring their side of the bargain, but the villagers don’t have the same luxury. 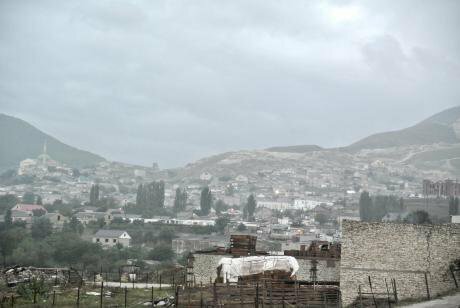 The principle of collective responsibility is the main anti-terrorist tactic in Dagestan, and the relentless pressure from the security services means that the more active part of the local population has to look out for the rest. In other words, at the meeting three years ago, the government basically made Gubden’s residents responsible for preventing terrorism on their patch. The villagers, lacking the ideological framework of the jihadists, had no option but to train themselves into a defensive force. This, in theory, requires wide powers and access to appropriate high technology. But in practice, pressure from the security forces on the one hand, and the authorities’ use of the principle of ‘divide and rule’ on the other means that people have to manage with fewer resources. The extent to which individual villagers are involved in these preventive measures depends on which mosque they attend. Those who profess a more ‘traditional’ type of Islam are by definition more trusted by the authorities than their Salafi brethren. On the basis of reports from ‘trustworthy’ imams and local council members, the police draw up so-called ‘Wahhabi lists’ that include the names of anyone who worships at an ‘alternative’ mosque. But that is not the only reason for someone to be labelled undesirable. The now former United Russia council member Magomedrasul Aigumov was included on the list in 2013, when the security forces killed his son Magomedkhabib during a raid. This year, the local party nominated him as a candidate for the local elections in September, but the electoral commission refused to register him because of a letter from the local police chief stating that Aigumov was on the ‘Wahhabi list’. A court upheld the electoral commission’s decision, thus infringing the principle of presumption of innocence guaranteed by the Russian Constitution. People in Gubden tell me that Aigumov is not the only ‘traditional’ Muslim whose name is on a list. These lists are drawn up on political, not religious grounds. Those on the list—and there may be as many as 300 people in Gubden—have restricted rights and freedoms. ‘Sometimes you’re on your way somewhere on business and they stop you for three hours. They look you up on a database, examine your car, ask all sorts of questions. You might be taking your child to hospital, but they still won’t let you go until all the procedures are complete,’ says Aigumov. In some sense, the villagers live in a judicial counter-terrorist operation. And if the situation becomes destabilised, it is the people on the list who will be caught in both the crosshairs— literal and figurative—of the security forces. It is these people on the list who are the most committed to a peaceful settlement; they are expected to take the most active role in the maintenance of order. The sorokovka makes drug addicts and drunkards sign a promise of good behaviour on video. Paradoxically, the sorokovka, the core of which is made up of people on the wrong side of the law, is in fact a carbon copy of the state. Not in the abstract sense, but the one you encounter on a daily basis. In both cases, the ‘strong arm’ is positioned as an alternative to chaos—the public is not offered any other option. And both the official authority and the alternative strive to control not just the actions of their fellow citizens, but also their thoughts. By contrast, the state’s chain of command—the vertical—is designed from the top down, not the bottom up. Thus, those who are climbing the official ladder of power have no need of the public’s approval: their careers are completely in the hands of their immediate superiors. But the state system is still so inefficient that central resources allocated to concrete ends vanish at republic and district levels, even when Putin’s reputation is involved. In Gubden, for example, nearly 200m roubles (£2.08M) destined to build a reservoir dam and sewage treatment plants simply disappeared without trace. The same ‘economy’ factors are presumably the reason why the hospital in nearby Gurbuki, destined to serve both villages and also funded by central government, is yet to appear. Russian security forces stage a special operation against Vagabov's militants in the Gubden region of Dagestan, 2010. Photo (c) Bashir Aliyev/VisualRIANAfter these debacles, the sorokovka looks more attractive. Its activists don’t just exercise control over the population, but try to improve its socio-economic position in whatever way they can. Whether it’s a question of asphalting a road or laying a water main, they take on the responsibilities of government. On the day I visited, they even took collection of a fire engine funded by the community. I’m not taking it on myself to judge whether the appearance of the militia has been a significant factor in the anti-terrorism campaign, but the people of Gubden report that the incidence of ‘ordinary’ crime has certainly fallen. And they are genuinely puzzled why a village that kept its young men out of the ‘forest’ and where crime rates are minimal is still considered a hotbed of extremism. Our improvised discussion session in the administration building has finished, and most people have left. A few of us are still hanging around, and we somehow started talking about the 1990s. One reason why the villagers hate the Wahhabi list is that it reminds them of those years and losses. But the government is unlikely to remove this ‘pressure regulator’ in the near future: it is too useful an instrument for getting at ‘undesirables’ - and for simple extortion. ‘Write that people’s patience is rapidly running out,’ the villagers tell me as I prepare to leave. It’s difficult to put myself in their place, but I imagine that when the state dehumanises you on daily basis, you want to shout about it as loud as you can.